‘Tri-dots’ is a fun activity to engage kids with in their free time! 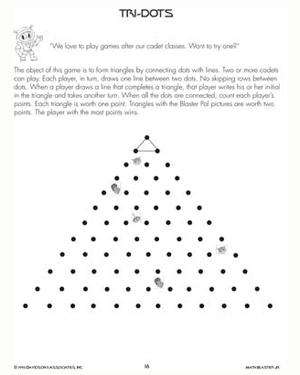 Kids need to connect the dots and form as many triangles as possible. The objective is to be the one drawing the last line of each triangle. Just follow the instructions detailed in the worksheet and watch the little ones fight it out to win the game! The ‘Tri-dots’ activity has elements of math and encourages kids to use their critical thinking and logical reasoning skills as well.